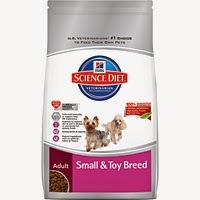 Hill’s Pet Nutrition, Inc. of Topeka, KS is voluntarily recalling 62 bags of Science Diet® Adult Small & Toy Breed™ dry dog food as they have the potential to be contaminated with Salmonella. The suspect product, part of a single production run, was distributed to 17 veterinary clinic and pet store customers in California, Hawaii and Nevada between April 24 and May 13, 2014. Chicken Meal, Whole Grain Wheat, Brewers Rice, Whole Grain Sorghum, Soybean Meal, Cracked Pearled Barley, Pork Fat, Chicken Liver Flavor, Soybean Oil, Flaxseed, Lactic Acid, Pork Liver Flavor, Dried Carrots, Dried Spinach, Dried Grape Pomace, Dried Tomato Pomace, Dried Citrus Pulp, Iodized Salt, Oat Fiber, Choline Chloride, vitamins (Vitamin E Supplement, L-Ascorbyl-2-Polyphosphate (source of Vitamin C), Niacin Supplement, Thiamine Mononitrate, Vitamin A Supplement, Calcium Pantothenate, Biotin, Vitamin B12 Supplement, Pyridoxine Hydrochloride, Riboflavin Supplement, Folic Acid, Vitamin D3 Supplement), minerals (Ferrous Sulfate, Zinc Oxide, Copper Sulfate, Manganous Oxide, Calcium Iodate, Sodium Selenite), Taurine, Potassium Chloride, Mixed Tocopherols for freshness, Phosphoric Acid, Beta-Carotene, Natural Flavors. This diet contains grains, salt, soybean oil and other ingredients which can be problematic for For optimal nutrition, AskAriel Your Pet Nutritionist recommends feeding your pet a grain-free, hypoallergenic diet. Use canned or raw frozen diets for best results. Pets with allergies or digestive problems can experience relief of symptoms using raw frozen hypoallergenic protein sources such as rabbit. To learn more about the pros/cons of using a raw frozen diet for your cat or dog, please read this comprehensive pet nutrition article.